La puntata di stasera di Prospettive musicali - dalle 22:37 alle 23:30, su Radio Popolare - è interamente dedicata a Comicoperando: A Tribute to the Music of Robert Wyatt. Alessandro Achilli presenta il debutto di domani (Modena, teatro Comunale, ore 21.00) ripercorrendo gli incontri dei membri di Comicoperando con Robert Wyatt: si ascolteranno quindi gruppi come Wilde Flowers, Hatfield & the North, Slapp Happy, Henry Cow, Working Week, Swapo Singers, Last Nightingale, News from Babel, Soupsongs e ovviamente lo stesso Wyatt. 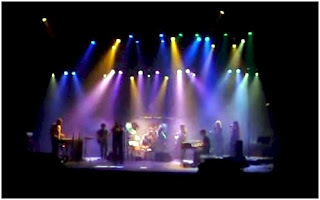 Il programma del concerto si scarica in .pdf da http://tinyurl.com/yg7wqk7. La scaletta (probabile) prevede: Pataphysical Introduction (arr. Alex Maguire), September The Ninth (arr. Annie Whitehead), Little Red Robin Hood Hit the Road (arr. Cristiano Calcagnile), Unmasked (arr. Michel Delville), Gloria Gloom (arr. Cristiano Calcagnile), Alifib (arr. Annie Whitehead), Just as You Are (arr. Gilad Atzmon), Sea Song (arr. Annie Whitehead), Little Red Riding Hood Hit the Road (arr. Annie Whitehead), Calyx (arr. Phil Miller), Fol de Rol (arr. Richard Sinclair), Memories (arr. Michel Delville), Alien (arr. Annie Whitehead), God Song (arr. Phil Miller), Was a Friend (arr. Michel Delville), O Caroline (arr. Dave Sinclair), Maryan (arr. Cristiano Calcagnile), Dondestan (arr. Gilad Atzmon), Forest (arr. Annie Whitehead). Un'aggiornata cronologia wyattiana, redatta da Achilli, è in http://tinyurl.com/rwcron. Un'intervista a Michel Delville è stata trasmessa nella puntata di giovedì scorso di Battiti - ora è anche nei podcast archiviati in http://tinyurl.com/yh98x55 - mentre un'intervista a Richard Sinclair è presso De Wissel. C'è un nuovo album in solo di Tim Hodgkinson, alla distanza di quasi venticinque anni da Splutter. Si intitola Klarnt, e lo distribuisce ReR. Così nel mini-aggiornamento di febbraio 2010: "Tim's second solo clarinet CD, very different from the first. Not casual listening, this is a very concentrated, exposed and close reading of the instrument and its possibilities. Initmate and immediate". Si leggono al rinnovato sito www.rocktime.org/rio aggiornamenti e anticipazioni a proposito della prossima edizione del Rock In Opposition France Event, in programma dal 17 al 19 settembre 2010 a Carmaux, Maison de la musique de Cap Découverte. Ai nomi annunciati fin (quasi) dalla primissima ora, altri si stanno via via aggiungendo: Art Bears Songbook, Sleepytime Gorilla Museum, Miriodor, il progetto "Cross the Bridge" di Thierry Zaboitzeff (bassista in Art Zoyd fino al 1997), il trio Full Blast con Peter Brötzmann, Marino Pliakas e Michael Wertmüller. Sarà Richard Thompson il curatore della prossima edizione del festival londinese Meltdown, in programma a giugno 2010: "Named by Rolling Stone Magazine as one of the Top 20 guitarists of all time and the recipient of both an Ivor Novello Award for songwriting and the 2006 BBC Lifetime Achievement Award, Thompson first emerged in 1967 as a founding member of British folk-rock innovators Fairport Convention before carving out an extremely successful solo career and establishing himself as one of the leading singer-songwriters of his generation. Over his career he has collaborated with Linda and Teddy Thompson, Nick Drake, Elvis Costello, Bob Dylan, Loudon Wainwright III, David Byrne and director Werner Herzog amongst others. He follows in the footsteps of past Meltdown directors Ornette Coleman, Patti Smith, John Peel, Robert Wyatt, Elvis Costello and other luminaries, curating a festival that will take place across the 21-acre Southbank Centre site and reflecting the diversity of his career and enduring influence. 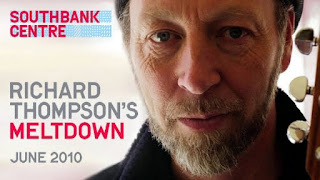 Richard Thompson's Meltdown takes place in June. The full line-up will be announced shortly." 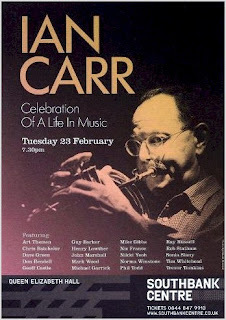 A un anno esatto dalla sua scomparsa, due eventi celebrano la memoria di Ian Carr: uno speciale concerto (Celebration of a Life in Music) a Londra, Queen Elizabeth Hall il prossimo 23 febbraio e la pubblicazione dell'inedito Don Rendell-Ian Carr Quintet ~ Live at the Union 1966 per opera dell'imbattibile Reel Recordings. In celebration of the hugely respected hero of British jazz, who died last February, Celebration of a Life in Music features a re-formed edition of Carr's seminal electric band, Nucleus; the London premiere of 'Northumbrian Sketches' with soloist Guy Barker and string ensemble conducted by Mike Gibbs; plus Michael Garrick with a group evocative of his collaborations with Ian Carr in the 1960s. Norma Winstone, Ray Russell, John Marshall and Tim Whitehead will be among many leading British jazz stars taking part. Jazz in Britain during the 1960 has found many musical voices speaking uniquely beyond their American inspiration, but few spoke as eloquently as the Don Rendell Ian Carr Quintet. Formed in 1964 by modernists Don Rendell (saxes/flutes) and the late Ian Carr (trumpet/flugelhorn), their quintet was perfected by the tremendous rhythm section of composer Michael Garrick (piano), Dave Green (double bass) and Trevor Tompkins (drums). While a handful of classic records made for EMI/Columbia U.K. between 1964 and 1969 remain among the most sought after missing discs in many a British Jazz record collection, it was on the bandstand where the Quintet’s music found its greatest expression. What a revelation then to discover this lost private recording, which captured six chapters played from the stylistically expansive book of compositions penned by Don Rendell, Ian Carr, and Michael Garrick. The Quintet’s concert took place at the Students Union Hall at London’s University College on December 12, 1966 among an intimate and enthusiastic audience of friends, and remarkably was recorded by George Foster. Deputizing for bassist Dave Green, who left early due to a double booking at Ronnie Scott’s Old Place, was New Jazz Orchestra’s bassist Tony Reeves, who plays beautifully throughout. From the exhilarating, and hitherto unreleased, Trane’s Mood, through the lyrical Webster’s Mood, the quintet’s performance overflows with emotion and beauty. Nearly fifty years on Reel Recordings is privileged to present the Don Rendell - Ian Carr Quintet ~ Live at the Union 1966, in affiliation with the February 23, 2010 Queen Elizabeth Hall concert, “Ian Carr: Celebration of a Life in Music”. All proceeds from this CD to benefit Britain’s Alzheimer Research Trust. Già terminate presso Incus le audiocassette con la registrazione del concerto di Derek Bailey a Milwaukee, Winsconsin nel marzo 1983: ne erano state ritrovate alcune copie di recente, prontamente segnalate e messe in vendita attraverso il sito dell'etichetta. Karen Brookman ne racconta la curiosa provenienza: "In 1983 Derek Bailey was due to visit Japan for a concert tour and decided to take with him, for sale at the concerts, a cassette recorded live in Milwaukee. Approximately 500 cassettes were prepared and dispatched to the promoter in Japan but, in the event, the tour fell through and the cassettes were returned to England. On arriving to collect the two boxes containing the cassettes from the Post Office Derek found that they were badly damaged and, having to pay to re-gain them, decided to collect only one of the parcels. The salvagable cassettes - number not known, but probably around 150 - were subsequently sold at other live dates. 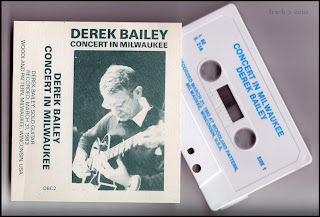 All are produced on a light-grey plastic cassette body with 'Concert in Milwaukee, Derek Bailey' plus date of concert, printed in light-blue directly on the cassette body. The cassette insert has the number DBC2 (no number on cassette itself)." "Pere Ubu: The First & The Last": al concerto londinese del prossimo 25 febbraio Pere Ubu eseguiranno oltre al materiale più recente anche l'intero album d'esordio, The Modern Dance, capolavoro del 1975 e manifesto di un'intera epoca. Circa la sua 'attualità' ("How do you think 'The Modern Dance' will be perceived by younger music fans who are new to Pere Ubu?") ebbe a rispondere qualche tempo fa David Thomas: "No clue. We didn't fit in 1975 and we don't fit now. We are very consistent that way. We tend to attract people who also don't fit." 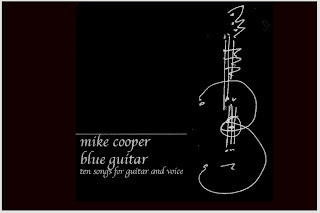 Mike Cooper diffonde gratuitamente in forma di podcast Blue Guitar-Ten Songs for Guitar and Voice, suo recente lavoro ideato a partire da testi di Thomas Pynchon e realizzato in solitudine - eccezion fatta per un paio di interventi dell'amico Tim Catlin - con chitarre acustiche ed elettriche affatto particolari: "The instruments I use here are resophonic guitars. One a metal bodied 1930's vintage National Tri-Plate and the other a copy of the first but made in carbon fibre by Alan Timmings in 1996 and given to me as a gift. These instruments have a very particular sound, volume and - as their name suggests - resonance. They don't work like other guitars and they make music unlike other guitars. Even playing them with or without finger picks, in plastic or steel even, produces a different timbre and 'feel'. The American composer Lou Harrison liked the National guitar so much that he wrote pieces specifically for it with altered fret positions to facilitate his just intonation scores. They are art-deco masterpieces." 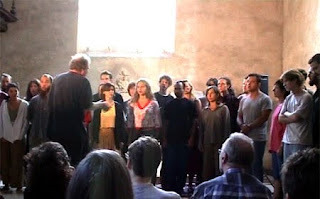 Dal 26 al 28 febbraio prossimi Phil Minton è a Bologna con Feral Choir per un seminario e concerto presso la Scuola Popolare di Musica 'Ivan Illich'. 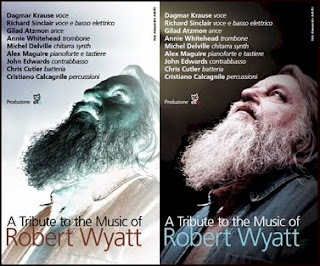 Sono presso il sito del Teatro Comunale di Modena le informazioni e le modalità di prenotazione dei biglietti per il debutto in concerto di Comicoperando-A Tribute to the Music of Robert Wyatt. La data è quella di lunedì 1 marzo 2010, con inizio alle ore 21. 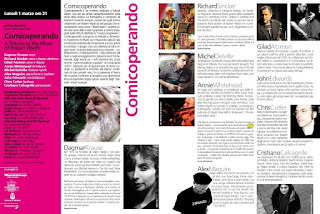 Dagmar Krause, voce; Richard Sinclair, voce e basso elettrico; Gilad Atzmon, ance; Annie Whitehead, trombone; Michel Delville, chitarra synth; Alex Maguire, pianoforte e tastiere; John Edwards, contrabbasso; Chris Cutler, batteria; Cristiano Calcagnile, percussioni. 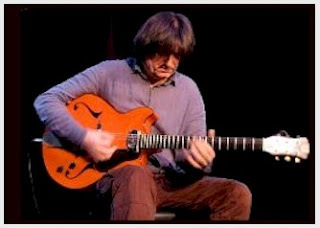 Due nuove pubblicazioni ReR sono annunciate nell'aggiornamento di febbraio 2010: un inedito del 1999 di Chris Cutler e Thomas DiMuzio con Fred Frith - ospite anche Beth Custer - in un'edizione (anzi, due) limitata e soltanto in vinile, e un recente lavoro del compositore macedone Nikola Kodjbashia, Explosion of a Memory, in omaggio a James Joyce, Heiner Müller e Valère Novarina. A limited edition of 1969 numbered copies pressed into 180 gsm virgin vinyl and rather beautifully (and horribly expensively, as it turned out) packaged. The music was recorded in California in 1999 with guest Beth Custer (clarinet) on one track. I like it. 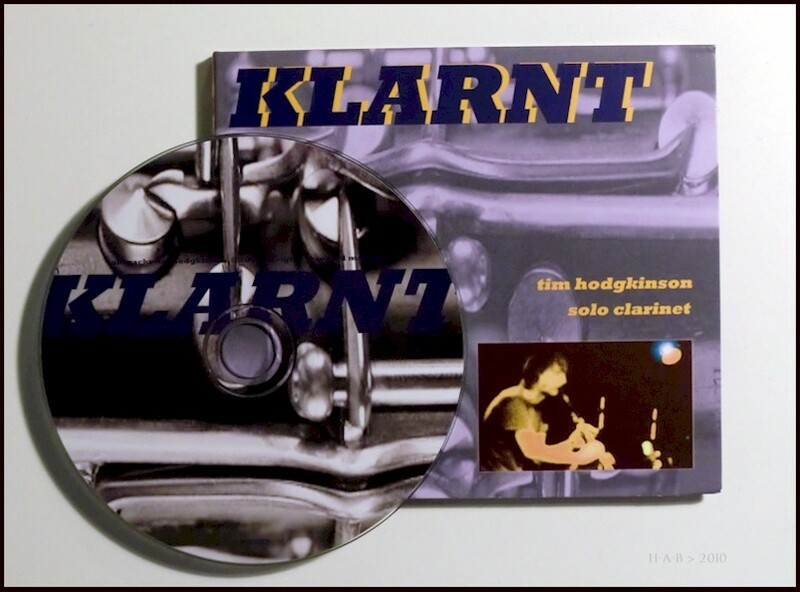 Carefully mastered by Tom Dimuzio in wide frequency, solid footprint, broad compass stereo. Somehow this just seemed to need to be an LP, it just wouldn't be the same - sonically, visually or ontologically - as a CD. Content-wise: Tom Fred and CC do what they do and you get a good seat – as well as something exquisite to look at and play with while you listen. A thing of beauty. An extended iterative, cycling, dissipating cloud of fragments, constantly shifting focus, which throws up detail, evolves, returns, settles and re-dissolves; it’s a four-dimensional explosion in which stretches of baroque, folk themes and Byzantine liturgy exist contemporaneously alongside modern and (arguably) post-modern materials and techniques, all shaken loose out of the same experiential block, much as strata emerge as tectonic plates fold one time over another. Long, beautiful, tonal stretches eventually emerge, lighter than air, drifting and attenuating to reveal, dreamily, the old simplicities behind. 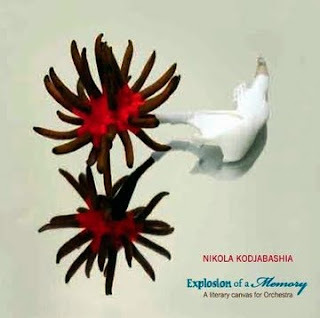 Full use is made of the 70 strong Macedonian Symphony Orchestra with subtle additional colouration from Kiril Dzajkovsy (live electronics), Nikola Kodjbashia himself (prepared piano) and Chris Cutler (extramural percussion). Immersive, timeless and unmistakably new, this music eschews existing schools to explore instead its own influences and contradictions. Great sound, massive footprint. 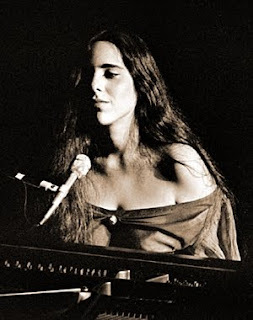 Per San Valentino Miles Mellough di Birds With Broken Wings torna a dire al mondo intero del suo amore eterno e bello per Laura Nyro, indicando - da More Than A New Discovery a The Loom's Desire - i luoghi e i motivi di maggior incanto e infatuazione. 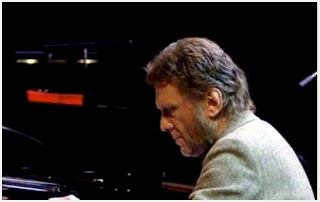 Intervista a Keith Tippett nella puntata di domani di Jazz Library, programma radiofonico della BBC condotto da Alyn Shipton: "Pianist Keith Tippett is a musician of extraordinary breadth and vision. His projects range from the vast 50-piece orchestra Centipede, so large it had its own private plane for touring, to introspective improvised solo concerts. He joins Alyn Shipton to pick the highlights of a recorded catalogue that spans over forty years, and which not only contains his ensembles large and small, but several surprises as well." Si legge in www.davebarb.demon.co.uk/dsbgfeat.html la seconda parte dell'analisi musicale dedicata al brano Jupiter Rising, dall'album Green and Blue di Dave Stewart & Barbara Gaskin. La disponibilità online degli articoli della nuova serie di 'Inside The Music' è limitata al solo mese di pubblicazione; avverte in proposito Stewart: "We won't be maintaining an online archive of past articles, so if you're interested in reading about the musical construction of this song (from Dave & Barbara's Green and Blue album) with accompanying audio clips and notation, please take a look / listen before it disappears at the end of this month!". 'Inside The Music' è anche il titolo del secondo libro di Dave Stewart, dopo 'Introducing The Dots' del 1981. I libri sono entrambi disponibili da Balafon Books (Regno Unito), Rittor Music (Giappone) e Hal Leonard (Stati Uniti), ma si trovano abbastanza facilmente anche attraverso il circuito Amazon. 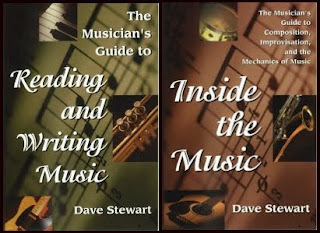 Dave Stewart's first book explains the basics of reading and writing music in a simple, unintimidating way. First published in the UK in 1981 under the title 'Introducing The Dots', the book (re-titled 'The Musician's Guide to Reading & Writing Music' in the US) was updated and reprinted in 1992. Dave's second book 'Inside The Music' (titled 'Introducing The Dots 2' in Japan) examines the inner workings of music, with chapters on chord voicing, MIDI, harmony, composition and improvisation. 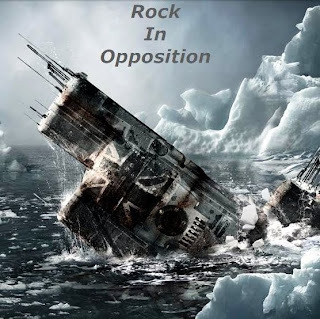 Alla puntata di sabato prossimo di A l'improviste, programma di Anne Montaron per France Musique, partecipa in solitaria uno dei campioni della scuderia Nato, il chitarrista Raymond Boni. Sabato 13 febbraio 2010, con inizio a mezzanotte. 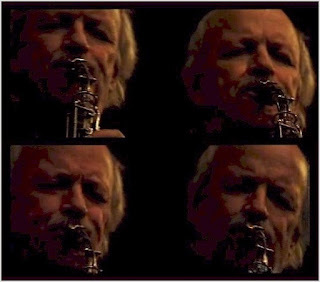 Décrit comme une sorte d'enfant de Django et Cecil Taylor, Raymond Boni joue en compagnie du saxophoniste André Jaume et de Joe McPhee, qui devient un compagnon essentiel du guitariste pour une collaboration durable (en diverses formations ponctuées de duos essentiels). Autre duo important, celui qu'il forme avec le saxophoniste Claude Bernard. En 1980 au festival de Chantenay-Villedieu, il rencontre Violeta Ferrer avec qui il enregistre à deux reprises. 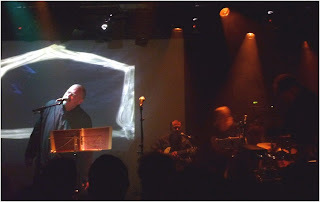 Il joue alors en trio avec Lol Coxhill et Maurice Horsthuis. Il se produit avec Lol Coxhill à diverses reprises aux festivals d'Angoulême et de Chantenay-Villedieu ainsi qu'avec Tony Coe, Joëlle Léandre, Annick Nozati, Toshinori Kondo, Jac Berrocal ou Sven Ake Johansson. Il est l'un des permanents de ce festival où, en compagnie de Terry Day et de Max Eastley, il crée les Mistrals qui enregistrent leur unique disque au titre éponyme. Il compose et participe comme acteur et musicien à des spectacles de danse avec la danseuse et chorégraphe Geneviève Sorin. Avec elle, il fonde Boni's Family avec son fils Bastien à la contrebasse (After the Rap). Il est membre fondateur du Big Band de Guitares qu'il quitte après le premier disque, travaille avec le quatuor Balanescu ou l'ensemble Louzadzak de Claude Tchamitchian. La discographie de ce guitariste hors normes est imposante. Il enregistre désormais pour Emouvance. Raymond Boni travaille actuellement en duo avec Hamid Drake ou avec le groupe Next to You (Joe McPhee, Daunik Lazro, Claude Tchamitchian). Lors de Minnesota sur Seine 2008, il retrouve la comédienne Violeta Ferrer avec qui il joue les Poemas de Federico Garcia Lorca et se produit en duo avec Anthony Cox. Quattro anni or sono ci lasciava Elton Dean. Oltre ad estratti presi dal doppio dvd ufficiale del concerto di Soft Machine Legacy al club parigino New Morning il 12 dicembre 2005, su YouTube si trovano altri brevi filmati dai concerti del compianto sassofonista negli ultimi mesi: per esempio con Soft Bounds, nel giugno 2005, una sera che era ospite del gruppo Jean-Michel Couchet, oppure nell'ottobre dello stesso anno con i belgi The Wrong Object, nel concerto dal quale è tratto l'album The Unbelievable Truth. Al sito dell'etichetta MoonJune Records i cenni biografici sono rivolti soprattutto alle vicende più recenti: "Elton Dean (born October 28, 1945, Nottingham, England; died February 8, 2006) was a jazz musician who performed on alto saxophone, saxello (a variant of the soprano saxophone) and occasionally electric piano. From 1966-67, Dean was a member of the band Bluesology, led by Long John Baldry. The band's pianist, Reginald Dwight, afterward combined Dean's and Baldry's first names for his own stage name, Elton John. Dean established his reputation as a member of the Keith Tippett Sextet from 1968 to 1970, and in the band Soft Machine from 1969 to 1972. Shortly before leaving Soft Machine he started his own group, Just Us. From 1975 to 1978 he led a nine-piece band called Ninesense. His own groups since then, usually quartets or quintets, have most often worked in the free jazz mode, with little or no pre-composed material. 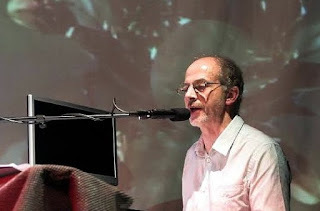 At the same time, he has continued to work with other groups that are very composition-based, such as guitarist Phil Miller's In Cahoots, drummer Pip Pyle's Equipe Out, and various projects with former Soft Machine bassist Hugh Hopper. In 2002, Dean and three other former Soft Machine members (Hugh Hopper, drummer John Marshall, and guitarist Allan Holdsworth) toured and recorded under the name Soft Works. With another former Soft Machine member, guitarist John Etheridge, replacing Holdsworth, they subsequently toured and recorded as Soft Machine Legacy, playing some pieces from the original Soft Machine repertoire as well as new works. Featuring Dean, three albums of theirs have been released: Live in Zaandam (2005, MoonJune Records), New Morning - The Paris Concert (2006, DVD/2cd – InAkustik Records) and the studio album Soft Machine Legacy (2006, MoonJune Records). Dean's last musical collaborations also included those with Soft Bounds (a quartet comprised of Dean, Hugh Hopper, Sophia Domancich and Simon Goubert), Alex Maguire's project Psychic Warrior, and Belgian rock-jazz band The Wrong Object. Dean's playing style could be equally tonal as scarily atonal; his forays into rock with Soft Machine feature a pioneering use of extreme amplification (particularly the live period between albums Third and Fourth)." Un'intervista a Kerry Minnear realizzata pochi giorni fa si può ascoltare, divisa in tre file .mp3, al blog We Will Rock You. 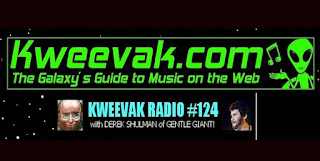 Scrive l'intervistatore: "I have been lucky enough to interview both Derek Shulman and Gary Green from Gentle Giant previously, so I was very happy to get the opportunity to interview keyboardist Kerry Minnear, who called me from his home in the UK on Thursday, January 28th to discuss the new releases and his career with Gentle Giant. Over and over what strikes me about the members of Gentle Giant is how different they are from most of the rock musicians I deal with. I routinely interview some of the most famous musicians of a certain time period, as well as some lesser-known people, and they tend to fall into two distinct categories. The ones who have succeeded but whose success is mostly in the past tend to be embittered, looking back over their shoulders at a time in their lives that has been gone for decades, but continues to define them in the public eye in a way they can never really escape. The ones who took a shot but didn’t really achieve commercial success tend to be embittered by their lack of success. The members of Gentle Giant, by sharp contrast, seem to genuinely celebrate the music they created together; they seem to understand that the very nature of what they created was always going to limit its commercial prospects, and they seem to be okay with that, even proud of it. There’s a humility about the members of the group that isn’t really the norm for musicians. In the case of Kerry Minnear in particular, he is so soft-spoken and unassuming that it’s almost difficult to picture him in a setting where he was required to earn his living by going out and entertaining people en masse, and it’s almost impossible to imagine him having to function in the shark tank of the Seventies music business." 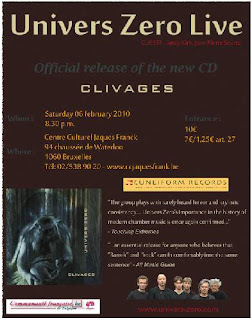 Un concerto stasera a Bruxelles segna il debutto ufficiale del nuovo album di Univers Zero, Clivages (su etichetta Cuneiform Records). La formazione è un sestetto: Daniel Denis (drums), Michel Berckmans (oboe, bassoon & English horn), Pierre Chevalier (keyboards), Dimitri Evers (bass), Martin Lauwers (violin), Kurt Budé (clarinets & saxophones). Univers Zero, Magma e Madelgaire saranno i protagonisti del festival Alter Ego il prossimo 20 febbraio 2010 a Soignies, Belgio: "Cette édition du Festival Alter Ego promet, d’ores et déjà, d’être à plus d’un titre exceptionnelle puisque, d’une part, l’Espace culturel Victor Jara servira pour la première fois d’écrin à l’événement et que, d’autre part, le légendaire groupe Magma en assurera la tête d’affiche. Ce groupe fondé en 1969 par le compositeur-batteur-chanteur Christian Vander est, en effet, toujours en activité et est à l'origine du genre musical baptisé Zeuhl, mélangeant rock, jazz, avant-garde et chant choral. Le groupe a exercé une influence inestimable sur le jazz-rock et l'avant-garde musicale à travers le monde et a fait connaître des musiciens français et étrangers de premier ordre, comme Didier Lockwood ou Claude Engel, parmi de nombreux autres. On retrouvera également sur la scène du festival Univers Zéro et Madelgaire. Un partenariat Alter Ego, Centre culturel de Soignies et Centre culturel régional du Centre." 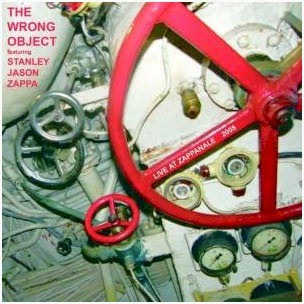 "The Wrong Object teams up with Stanley Jason Zappa (tenor sax) and Nick Skrowaczewski (percussions) to radically revisit old sounds and create new ditties ... in a far from silent way! This explosive septet, who performed at Zappanale in August 2008, is producing music which is free and open, loose but tight. Despite their inclination towards free form these guys never lose sight of the groove (making it perhaps less of a dancefloor than other prog-jazz bands) in their exploration of the space between, rather than the fusion of nu-jazz, improvised music, electronics, progressive chamber rock and other related sub-genres. An ideal introduction to their recent live repertoire." Già una dozzina di anni fa, ben prima di acquisire parentela in casa Gong, Dave Sturt e Theo Travis avevano allacciato legami progettando insieme la sonorizzazione in studio e dal vivo di pellicole dell'epoca del muto: il sodalizio, Cipher, ha prodotto nel tempo concerti, album e installazioni multimediali cui talvolta ha preso parte lo stesso Daevid Allen. In questi giorni, confermando una certa preferenza per l'horror ed il noir, il duo si è rimesso in pista con proprie musiche per Il gabinetto del dottor Caligari, in occasione del novantesimo compleanno del capolavoro di Robert Wiene: "It's the most influential of German Expressionist films. 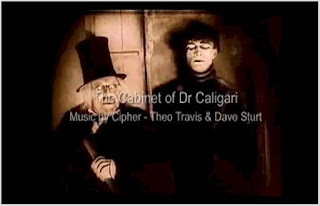 Now, to mark the 90th anniversary of the making of The Cabinet of Dr Caligari, the electro-jazz duo Cipher have composed a new soundtrack to accompany its nightmarish scenes. Updating the tradition of live pianists in cinemas, the duo are performing the new score live as the silent film is screened in its original hand-tinted version across the country this month. 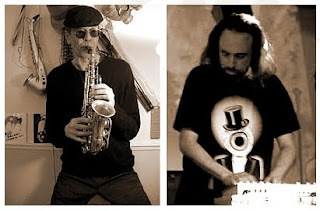 Cipher's Theo Travis plays haunting soprano saxophone, flute and keys, and Dave Sturt plays fretless bass while using pedals to produce the sounds that create their layered, dark, atmospheric music. Director Robert Wiene's 1920 film tells the tale of Dr Caligari, a hypnotist who travels the carnival circuit with somnambulist Cesare. When a series of murders coincides with the pair's visit, it appears the hypnotist has been ordering Cesare to commit the murders. But is all as it seems? Cipher have a history of writing scores for sinister films, including Alfred Hitchcock's The Lodger and Blackmail, FW Murnau's The Last Laugh, and GW Pabst's Pandora's Box in their repertoire. Travis explains: "We tend to pick films that are dark to write new music for. It's about capturing the mood of the film with a mixture of improvisation and composition. The Cabinet of Dr Caligari is one of the most moody and dramatic films ever made, one that continues to exert a huge influence on film-makers". Geoff Leigh e Adriano Lanzi compiono questa settimana un breve giro di concerti in Italia: il 4 febbraio a Roma (Scuola Popolare di Musica di Testaccio, ex Mattatoio), il 5 febbraio a Pisa (circolo Caracol) e il 6 a S. Vito di Leguzzano, Schio VI (Centro Stabile di Cultura). Calyx e Wikipedia aiutano a comporre il quadro dei suoi trascorsi musicali, da Henry Cow in poi, mentre di sé così annota Leigh: "Generally a nice bloke according to most of my friends - pretty good cook - fairly sociable - like a good discussion / natter, but also need plenty of space, peace & quiet. Otherwise a normal scrawny ol' jazzer/rocker with a taste for the strange, beautiful, weird, wonderful, & bizarre aspects of human life."